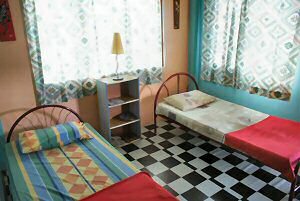 Tony’s guest house must be backpackers paradise: a huge bedroom with 2 single beds will only cost you RM22 or less than $7. Accommodation in Malaysia can be both cheap & good! Unfortunately, we aren’t backpackers, so we weren’t too happy to share common bathrooms and toilets. But this budget hotel was good for the experience and it saved us quite some money. The owners are very helpful if you contact them in advance. See the latest pictures (March 2009) of the newly painted rooms in Tonys Guesthouse. 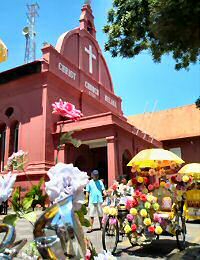 The center of Tonys guesthouse is owner Tony Chao, who can provide you with lots of traveling information about Malaysia and Thailand. Best of all: give Tony a call or send an email (cobia43 [at] hotmail.com) and he will pick you up from the bus station if you happen to arrive in Malacca Malaysia using public transport. 4 rooms on the 2nd floor. On the ground floor and porch of the guesthouse is a typical Malaysian coffee shop where you can see Tony cooking or serving breakfast, lunch, dinner and drinks: both Asian and Western food is served. Breakfast is not included in your $7 : it’s not a charity but a cheap budget hotel! And you do need to enjoy the experience of having breakfast in a coffee shop: it’s dirt cheap compared to Europe and you have much more variety compared to boring hotels with boring continental breakfasts. 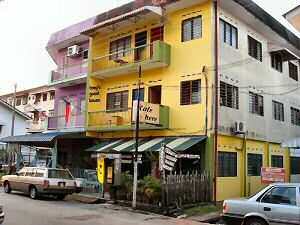 Tony’s guesthouse is located just between Little India and China Town. Most eateries, cafes, post office, banks, money-changers, news stands, mini markets and tourist sites are within a 10 minutes walk. If you don’t mind to share a common bathroom or you are not pleased with the hotel accommodation you checked in (we will maybe one day tell that story…), then Tony’s Guest House is a budget hotel giving you value for money: 1 huge room for 2 people for about $7. This guest house is great!! !So artisitic! With a lot of color.I felt so good there! Tony is also grest! He is a traveller! Tony if you have a mail , please give me it because I did’t find it on internet.